Next Friday, March 13, is Digital Learning Day, a day each year where we celebrate the ways technology can enhance teaching and learning and provide students with agency and voice in the classroom. 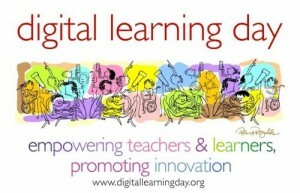 Learn all about Digital Learning Day here! We’d love if you could share your digital learning activities on the official DLD website by completing this form! I’d also love to highlight the work you and your students are doing on this blog, so email me with the details/summary of activities and I’ll spread the word! Perhaps your students will be blogging next week, or using Plickers or Socrative or Kahoot! for formative assessment in the classroom, or are creating digital stories using Storybird or sharing their learning via Google Slides or PowerPoint. Maybe they’re engaged in literature circle discussions via Wikispaces or connecting with one another in Edmodo or Google Classroom! Maybe they’re trying some activities from the ConnectED Are your students reading their favorite stories online via Raz Kids or BookFlix. No matter what the activity, there is surely something worth sharing with your school community on Digital Learning Day! There are also a number of professional learning opportunities available to you through the Digital Learning Day Live! and other activities. Check out the website and learn more about how you can get involved! 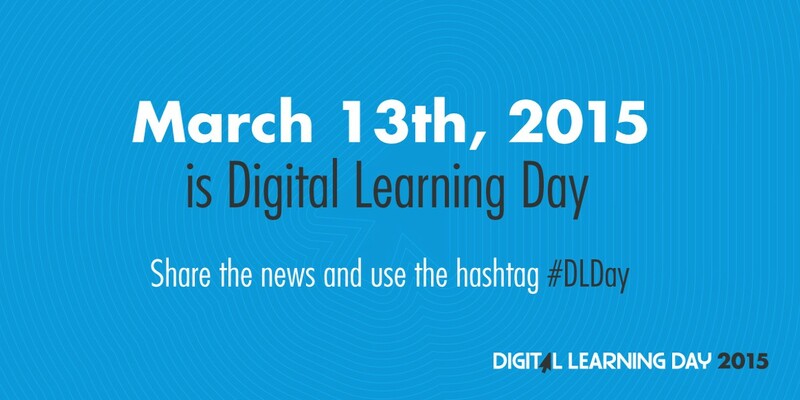 You can follow the hashtag #DLDay on Twitter to follow along with the day’s events, too! This entry was posted in Connected Learning, Creation, Professional Development, Resources, Updates and tagged Digital Learning Day on March 4, 2015 by elemtech. Less than one month until Digital Learning Day! Digital Learning Day is February 5, 2014! While many of you incorporate technology into students’ everyday learning experiences (yay! 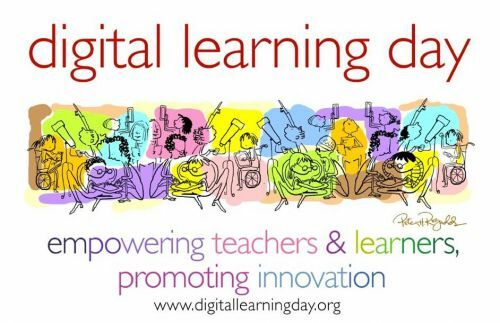 ), Digital Learning Day is a day for teachers and students to explore new methods of using technology to support learning and/or extend the ways in which students use technology to collaborate, share, create, and communicate with one another and the world. A number of lesson plans are available for teachers to use to support Digital Learning Day activities. Topics range from Writing Powerful Blog Comments to Jigsaw Plot Development to Visual Book Report. Check them out here! There are also Toolkits available for a number of content areas to help you get inspired and think creatively about using digital tools to enhance student learning. You’re not limited to the activities and ideas shared by the DLD folks. Do you want to get your class connected with another via Twitter? Do you want to learn about ways students can share and summarize their learning through online project work? Are you interested in helping your students create and communicate differently? Do you want to try new research tools to promote critical thinking? Do you want to schedule a Skype chat with an author or expert in the field? Do you wish to have students continue the Hour of Code activities they began during their computer lab specials? Do you want to find another classroom around the world who is blogging, so your students always have someone to comment on their posts (and so they can comment on others’ writing)? The possibilities are endless, not just for Digital Learning Day, but for the entire year! How will you be celebrating Digital Learning Day in your classroom? Please contact Lynmarie so she can be sure to share your class’s experiences on this blog! This entry was posted in Connected Learning, Creation, Resources and tagged Digital Learning Day on January 9, 2014 by elemtech. Save the Date: Digital Learning Day 2014! Digital Learning Day will be held on February 5, 2014 in conjunction with state events and the national event hosted by the Alliance for Excellent Education at the Library of Congress in Washington, DC. This powerful grassroots campaign promotes the effective use of technology to improve outcomes and achieve higher college- and career-ready standards for all students in K–12 public schools. Digital Learning Day promotes the belief that every child deserves the opportunity to learn in a robust digital environment every day with the goal of success in college and a career. Common-sense and effective applications of digital learning should be fully integrated into all of America’s schools, libraries, coffee shops, and homes to promote life-long learning and good citizenship. It takes less than five minutes to add your voice. I ask that you add your voice and consider planning classroom-based activities for your students and parents to get involved. Activities and events can be as simple or complicated as you like. Feel free to use Digital Learning Day’s interactive lessons (more coming soon), host a technology fair to showcase student work, check out the teacher toolkits for ideas, or simply try something new that better integrates technology into good instructional practice. Regardless of your level of comfort with instructional technology, Digital Learning Day has something for everyone. In addition to the national event and its related activities, all fifty states and DC are making similar plans. This is a great opportunity to use the momentum from these national and state-awareness campaigns to highlight your district- and school-level digital learning efforts to media, community leaders, parents, and local policymakers. Thank you for supporting digital learning! Please let me know if your class/team/school is planning any Digital Learning Day events! I will continue to share ideas over the next several weeks and wish to feature your activities on this blog and share with the world! Click here to ‘Like’ Digital Learning Day on Facebook. 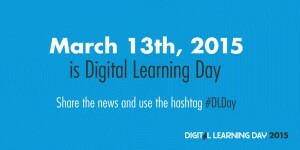 Click here to follow Digital Learning Day on Twitter! Here is a PDF with more information about Digital Learning Day! This entry was posted in Connected Learning, Professional Development, Resources and tagged Digital Learning Day on November 14, 2013 by elemtech.